New Delhi: Five people, including BJP MLA Bhima Mandavi, were killed when Naxals triggered an improvised explosive device in Dantewada district of Chattisgarh on Tuesday. In violation of EC guidelines to not refer to forces in campaigning, Prime Minister Narendra Modi tells first time voters to dedicate votes to Pulwama martyrs and those who conducted the Balakot airstrike. PM attacks Congress for corruption after IT raids on Madhya Pradesh chief minister Kamal Nath’s aides result in huge cash haul. Opposition alleges misuse of Central agencies to target political opponents. How did the television channels report these stories and more. 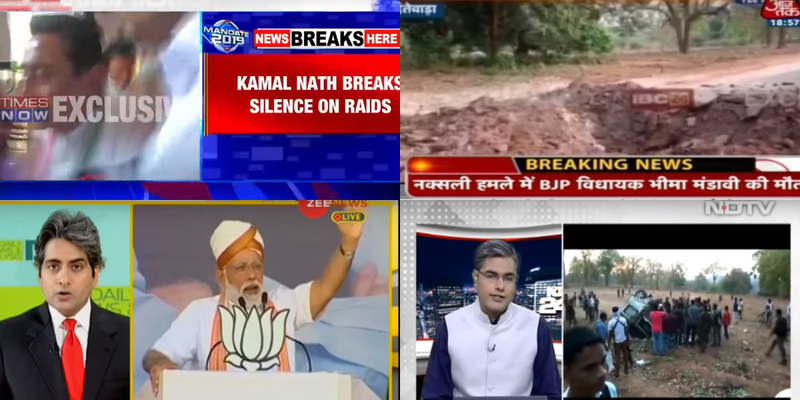 Through its headlines, “BJP convoy attacked in Chhattisgarh” and “Naxal attack 48 hours before polls”, the channel discussed the attack. Senior editor Vishnu Som said the director general of state police told him that the MLA was advised not to take this route as it was not properly sanitised. “But he decided to take this route despite the warning. It was a convoy of three vehicles and Bhima Mandavi’s vehicle was hit”. There was also a gunfight between Naxals and other security personnel. Anchor Nidhi Razdan said the bigger issue is “why attacks keep happening”. Congress spokesperson Shama Mohamed recalled the attack of 2013, in which 27 party people, including senior Congress leader V.C. Shukla, were killed. “We need better intelligence to see that these things do not happen,” she said. Som added that this is the “second worst attack” in the region. The channel also spoke about the intensity of the blast through headlines like “Blast leaves huge crater” and “Massive blast splits bullet-proof jeep”. In its programme “Rapid Fire”, the channel used “#281CrCashLog” and headlines like “Pay offs to Delhi AICC under lens” and “PM brands it notes for votes” along with the IT raids story. Anchor Navika Kumar then asked: “Even if I agree with your logic that BJP is nervous – but have these notes been found in BJP office”. Kumar said in the expenses list recovered during the raids, “AICC Delhi” and “AICC Election Bond” have been clearly mention. She said the worst kept secret of elections is that CMs have to generate funds for central leadership. It too looked at the IT raids through a pro-Centre lens. Headlines like “MP raids: 8 million mothers, children betrayed” and “Loot the poor, fund party?” and a “#CongHawalaCashNote” indicated the channel’s belief. Anchor Arnab Goswami insisted that “people who looted owe an explanation to the people of the country”. Journalist Sanjeev Srivastava said “while money has been found, the diary was too inconvenient” a way to implicate the Congress. BJP spokesperson Nalin Kohli said “in this case there was a credible link between the seizure and from where the money came and thus the notings form substantial evidence”. 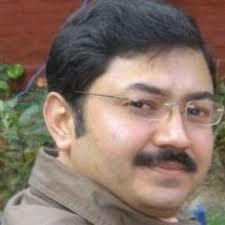 Tauseef Ahmed Khan of Trinamool Congress questioned by Income Tax authorities only go after the opposition and not corrupt BJP leaders. The “Election Express” of the channel drove into Puducherry to look at what voters want. The programme looked at “poll issues in quaint Puducherry”. “Puducherry will witness a high-stakes battle for one Lok Sabha seat in the second phase of elections on April 18. Can chief minister V. Narayanasamy of the Congress win back the seat he lost in 2014?” it asked. In ‘Chunav India Ka’, the channel looked at elections in Bihar. It carried headlines like “CBI opposed Lalu bail plea” saying the agency charged that he was “Not applying for health reasons, but due to elections”. He was also seen taking a dig at Janata Dal (United) leader and chief minister Nitish Kumar, terming him a “paltu chacha” (turncoat uncle) for deserting the RJD and moving towards the BJP. “Paltu chacha now finds their DNA okay,” he quipped. In his primetime show, channel editor Sudhir Chaudhary spoke about Modi’s controversial speech in which he urged first time voters to vote for Pulwama and Balakot. The Election Commission later took note of this alleged model code violation. The channel showed how Modi pointed out that the first salary and first vote are very important for every individual. It had him saying that just the way you place your first earnings in the hands of your mother, sister or the deity you worship, so should you cast you first vote for those who laid down their lives in Pulwama or those who carried out the Balakot airstrike thereafter. It did not, however, mention that the EC had barred all parties and candidates from referring to the armed forces in their campaign. The channel showed Congress leader Priyanka Gandhi being heckled again by BJP supporters during a road show in Bijnore with chants of “Modi, Modi”. But she was not perturbed and threw flowers at them in a typical Gandhi-giri style. However, there was soon a clash between the BJP and Congress supporters and police had to intervene to separate the two. Earlier too, in several of her roadshows and rallies in Uttar Pradesh, Priyanka met similar sloganeering by BJP with a smile or a few gentle words.